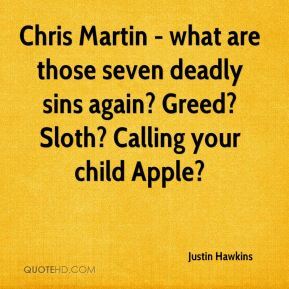 Chris Martin - what are those seven deadly sins again? Greed? Sloth? Calling your child Apple? 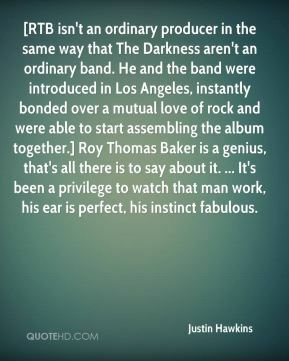 [RTB isn't an ordinary producer in the same way that The Darkness aren't an ordinary band. He and the band were introduced in Los Angeles, instantly bonded over a mutual love of rock and were able to start assembling the album together.] Roy Thomas Baker is a genius, that's all there is to say about it. ... It's been a privilege to watch that man work, his ear is perfect, his instinct fabulous. We pride ourselves on that. 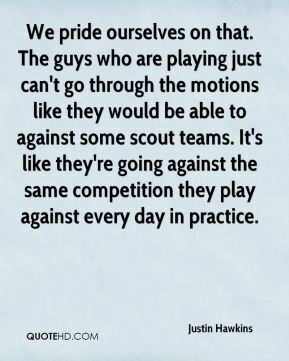 The guys who are playing just can't go through the motions like they would be able to against some scout teams. It's like they're going against the same competition they play against every day in practice. 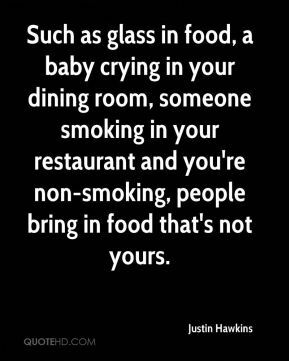 Such as glass in food, a baby crying in your dining room, someone smoking in your restaurant and you're non-smoking, people bring in food that's not yours. It wasn't a nice situation. 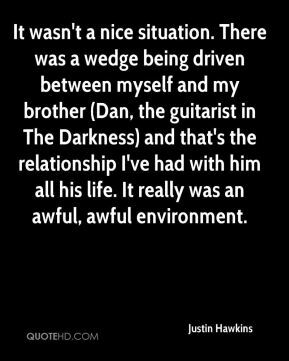 There was a wedge being driven between myself and my brother (Dan, the guitarist in The Darkness) and that's the relationship I've had with him all his life. It really was an awful, awful environment. 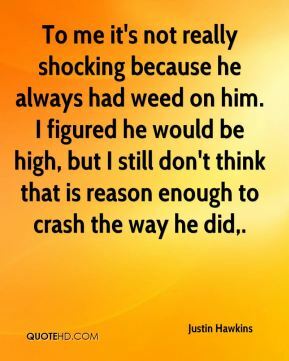 To me it's not really shocking because he always had weed on him. I figured he would be high, but I still don't think that is reason enough to crash the way he did. 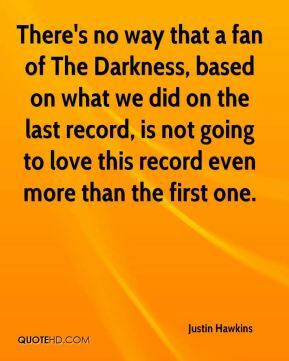 There's no way that a fan of The Darkness, based on what we did on the last record, is not going to love this record even more than the first one.